I greet you in a universal supplication and greeting of peace, a greeting extended to one another by 1.5 billion Muslims around the world; people from all nationalities, ethnicities, races, genders, and socio-economic backgrounds. Assalaamu alaykum. Much has been said in recent weeks about sacred ground. But on this day, in the shadow of the Lincoln Memorial, we declare that we are standing on sacred ground. The same sacred ground that the world-renowned African American contralto Marian Anderson stood on in 1939 and serenaded over 75,000 people after the Daughters of the American Revolution refused to let her sing in Constitution Hall because of the color of her skin. The same sacred ground that over 250,000 representatives of the progressive religious community, and civil rights and labor movements gathered on in front of this memorial during the March on Washington for Jobs and Freedom on August 28, 1963. The joyful noise heard on this occasion resonated throughout the halls of Congress and the streets and alleyways of this land until America’s dark citizens were finally freed of many of the legal shackles that prevented their full citizenship. The same sacred ground that over 100,000 Vietnam War protestors gathered on October 21, 1967 to protest our government’s pursuit of an unholy war of devastation that created widows, orphans, mentally and physically handicapped and dead soldiers on both sides of the conflict while diverting precious resources from our national education, employment, and social service needs. 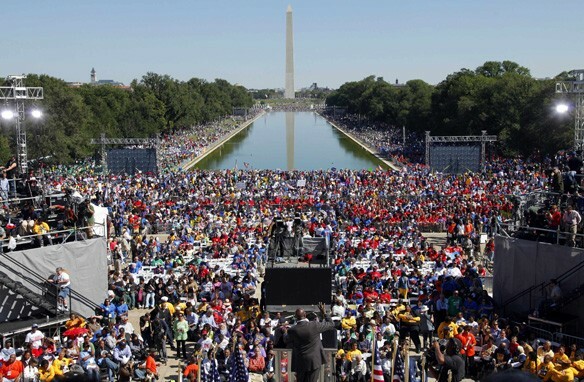 The same sacred ground that over one million African American men stretched from the US Capitol to the Lincoln Memorial on October 16, 1995 to recommit themselves to their families, crime and violence-free lifestyles, and positive work in our communities. It is sacred ground because the religion of Islam teaches that God is on the side of the oppressed. The Prophet of Islam, Muhammad the son of Abdullah, taught for the mighty and powerful to be particularly careful how they treat the weak and oppressed because there is nothing standing between the prayers of the oppressed and God, and God answers the supplications of the oppressed. So, One Nation Working Together makes this ground sacred today. We are lifting up God’s Name and championing the victims of uncontrolled corporate greed, an out-of-control military and prison industrial complex, and misguided education policies. It must be so, God-willing. 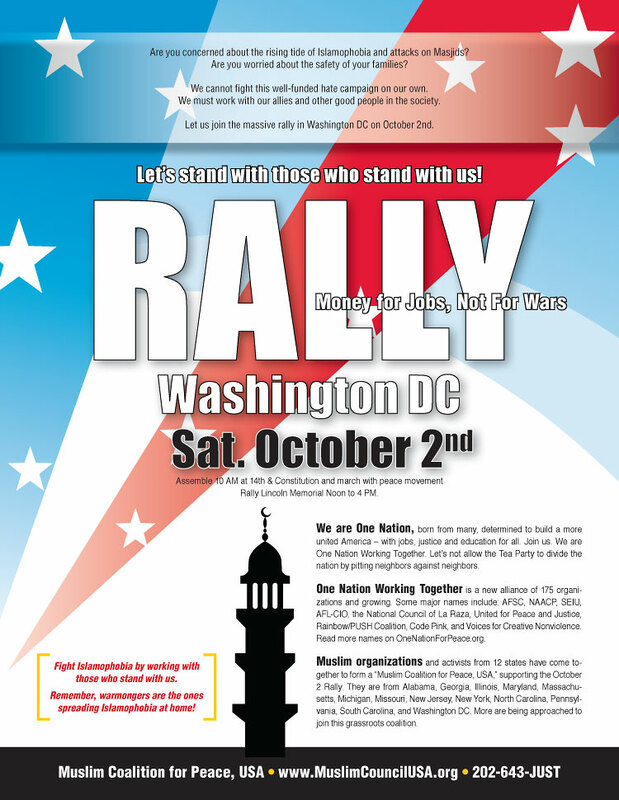 We will assemble on the Mall at 14th & Constitution just east of the White House. Please arrive by 10:30 am. Use the Federal Triangle Metro stop. See the Location Page for map. We will march as a group, along with peace movement, chanting peace slogans, to the Lincoln Memorial. The main rally begins at Noon. Bring your custom made playcard for peace. One Nation local coalitions are organizing thousands of chartered buses from many cities – sometimes at very affordable rates. Click here to find a bus from your area. If you are organizing a bus, you must register your bus on the One Nation site to obtain a parking space. Please register by Sept. 17 or as soon as possible. Chartered buses will arrive and park at RFK Stadium, which is 4 miles from the Lincoln Memorial, or possibly at the Pentagon, which is 2+ miles. The METRO will be running a weekday schedule on a Saturday. Since thousands of people will be boarding the Metro at the same time, advance group purchases of Metro Farecards are suggested. To purchase farecards call METRO at 202-962-5700 or 5716. This phone number is for credit card purchases only. If you wish to pay by check or money order you can do so also. When ordering, please state that you are with One Nation Working Together. You can purchase a $9 daypass which is good all day systemwide or you can purchase bulk $5 farecards which would cover the fare to and fom the metro stations that we wll be using. In order to get cards to the purchaser, METRO asks that cards are purchased before September 17, 2010. Download the form to order METRO cards. Questions? email Andrew at ONWTTransportation@gmail.com. 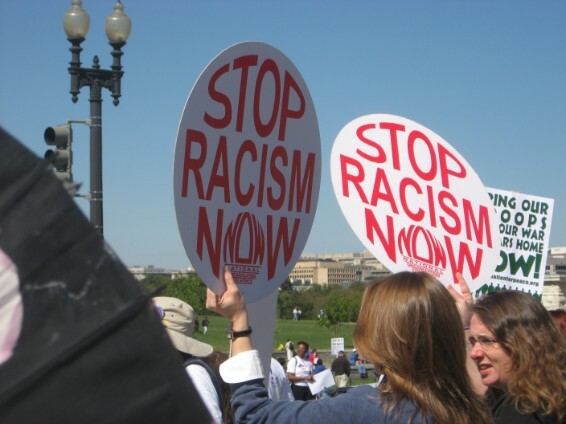 Fight Islamophobia by working with those who stand with us! There are a number of commercial options when traveling to DC, including flights, trains, and buses. Washington DC is accessible by 3 main airports: Reagan National (DCA), Dulles (IAD), and Baltimore-Washington (BWI). Of these, DCA is the closest to the city and is accessible by metro. There are buses, taxis, and shared-ride vans from all three airports. Check each of the airport’s websites to find more details. Trains come into DC through Union Station, a short walk from Capitol Hill but about 2 miles from the rally site at the Lincoln Memorial. Check out Amtrak for train schedules and prices. If you are coming to DC from the east coast, buses are often your cheapest option. Check the Chinatown buses or Bolt Bus.